You cannot help it. Most investors are ffected by the news. If there is good news, you want to immediately go out and be a buyers. If there is bad news, you want to be an immediate seller. Unfortunately, the flow of news is not linear. There will be noise in the information that is reported. News will be subject to revision. It will need to be clarified. The idea of market efficiency has us focus on immediacy but there is a greater need for a longer term clarity. News must be filtered and placed in the context of a framework or model. Ben Hecht was a newspaperman and if he has problems with the news, you should too. There is the adage that all politics are local. This may also be true of commodity markets. The grain markets are a perfect example. 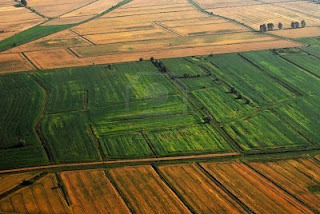 In the summer of 2010, there were significant grain shortages because of severe droughts in many key growing areas and strong demand from emerging markets. Russia placed an export ban on grains as it was hit by one of the most horrible droughts in their history. The bottom fell out of the Commonwealth of Independent States as a supplier of export grain when the bans went into effect. World grain importers were sent scrabbling for supply causing even further price increases. Local effects have global implications. In the 2011 period, there was a complete turn around in the fortunes of grain. Exports from Russia have surged from 4 million tonnes in 2010 from the previous year of 18.6 million tonnes. Now exports are back up to 14.8 million tonnes and growing. However, there may be a cap on how much will be exported as importers destock. Supplies are up from the lows of two years so the local growing success of key regions has translated into the global market. There is a reason to focus on local events. The IMF is seeking a bail-out fund of $500 billion from central banks. This would be a $300 billion addition to the $200 billion that eurozone countries pledged last month. The US stated that it would not participate in this fund increase. The money will have to come from emerging market central banks. This fund is supposed to be used mainly for the Eurozone itself. The need for emerging markets to participate is an interesting twist to the bail-out process; however, the focus is clearly on having more liquidity resources. How can the IMF be a player if it does not have the resources to provide money? Add more money to the gobal financial markets. Who does not want to be at this money punch bowl. ConocoPhilips has said it will cut its North American gas production by 4 percent and shifted resources to oil. Chesapeake Energy announced earlier in the week that it will reduce production by 8 percent and divert drilling to oil. Nevertheless, there are limits to how much production can be cut. First, natural gas is often found with oil so as long as oil prices are high, gas will be produced. Second, many wells are drilled and produced under partnerships so there has to be agreement with partners to shutdown. The partner's economics may be different so that their desire may be to continue production. Well production is not like a factory which can just be closed. The likelihood of an overshoot is not just a thought but a reality. The big central banks of the G10 have exploded their balance sheets and this will continue in 2012. They will continue because there are no other options. The liquidity will continue until it works. Their timing has been different but the action has been the same, increase the assets. Balance sheets increased in 2008 in response to the crisis, but the liquidity added to financial markets has continued everytime there is a hint that more liquidity may be needed through poor economic numbers. The Bank of Japan has been the exception in terms of size but even here the balance sheet is significantly larger than 2008. The Bank of England has tried to reduce its assets after the crisis but turned to two large jumps in assets in 209 and again in 2011. The US has followed two rounds of QE and is on the verge of undertaking a third round. The Fed will be hard pressed to not take action now that it has a 2% inflation target and prices have started to move lower. The most interesting case is the ECB which has adhered to their inflation target goals in discussions but have actually show to be the largest quantitative easer based on its loan portfolio. You don't have to buy government bonds to increase the balance sheet. It can come in the form of loans to the tune of $650 billion in three year paper. The ECB is forbidden from financing governments but no one said anything about the banks. They have also negotiated dollar swap lines which also provide liquidity. The ECB is every much the easer like the Fed and Bank of England. In fact, we should see the ECB become the ultimate quantitative easer before the year is over. 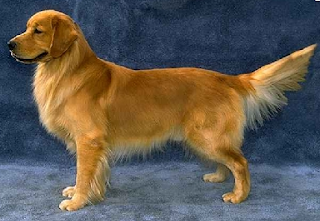 Recent news story suggests that Argentina is using ink sniffing dogs, golden retrievers to stop a dollar outflow by the wealthy. You have to do what you can to impose capital controls. The purpose is to keep dollars from leaving the country and cause a depreciation of the Argentine peso. The history of Argentina has been closely linked to the dollar when there was convertibility to stop inflation. Many have dollars held in safety deposit boxes and many exports of commodities are paid in dollars. This is just another form of financial repression which will continue as governments try and control wealth flows to pay for their deficits. 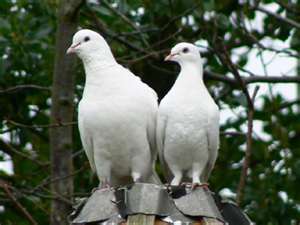 The Fed's policy announcement of a 2% inflation target and guidance that rates will stay low through possibly 2014 tells us the doves have eaten the hawks of the Board of Governors. It could have been worse with another round of QE immediately taking effect, but it is clear that the Fed is willing to pre-announce that deflation will not happen. This should not be a surprise. It also should not be a surprise that 2% is the target given it has been the de facto target for inflation across the developed world. If we have a 2% inflation target and near zero rates, it locks in a negative real rate of interest for an extended period. What should investors do? Borrow more money and lever up the portfolio, yet it is not clear this is what we want for the macroeconomy. I thought we wanted consumers to save and reconstruct their balance sheet. A negative real rate means that pensions will be destroyed at a fixed rate of 2%. So let's redistribute wealth from savers to borrowers. Who knows where this is gong to take us. There will be greater distortion in the markets over the next two years. We often use terms without understanding their origin. I recently had a question on the origin of the contago and backwardation. Their origins are not related to futures trading at all. The term originated in mid-19th century England and is believed to be a corruption of "continuation", "continue" or "contingent". In the past on the London Stock Exchange, contango was a fee paid by a buyer to a seller when the buyer wished to defer settlement of the trade they had agreed. The charge was based on the interest forgone by the seller not being paid. 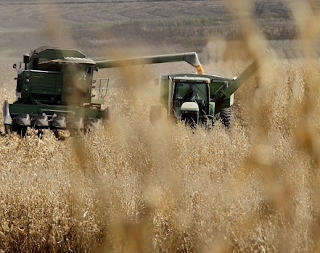 Cheap farm credit is available and this may lead to a bubble. If rates are cheap and farm prices are high, then farmers will borrow money. Farmer borrowing is not for seasonal buying of seed but to expand their farming through buying land. The government may be a primary cause of this potential bubble through the Farm credit system. The farm credit system makes government subsidized loans no different than Freddie Mac and Fannie Mae in the mortgage market. Its policy goal is to provide funding for farmers. It is the same system that needed to be bailed out in in 1987 after the farm crash in the early 1980's. With farm prices high and few alternatives viable for lenders in the commercial and residential real estate market, money has flowed to the farm sector. Providing money to farmers seems like a good bet in a rising price environment but the seeds of destruction are being planted when the money is used to further lever the balance sheet of farmers. Land prices go up. New equipment is bought. It also seems like a safe bet for farmers because interest rates are so low, but a decrease in prices will make it harder to refinance in the future. This will not be a short-run problem. Farmers should be able to make interest payments at these low rates, but roll-over risk in a falling price environment is real. The uncertainty index provides a good measure of what risks businesses and investors are facing at this time. This uncertainty story that business have avoided investing has been an argument that has been used for some time but has not been quantified. If there is a high degree of disagreement, then there is less likely to be investment funds committed. The uncertainty is often associated with key risk periods but the index shows an extremely high level over the last three years and has not fallen like other periods of uncertainty. The persistence of uncertainty is creating a global drag on employment and investment markets. This will only be cleared up if there more focused policy proposals. The Moynihan Principle -The late senator from New York once said that everyone is entitled to his own opinion, but not to his own facts. One of the key messages which we have learned from behavioral finance is that there is disagreement on the perception of what could be considered facts. As important as the disagreement on facts is the linkage between a given fact and what it may mean about the future. The facts are often not in dispute, it is their meaning which is the problem. Martin Wolf's January 3rd FT editorial "The 2012 recovery: handle with care" makes clear point that many of the policies that have been followed over the last decade are experiments. Some have failed and some have been successful but they are experiments nevertheless. Financial deregulation was an failure. Housing based recoveries were a failure. Driving rates to near zero pre-2008 was a failure. The injection of public money was a partial failure. The cuts in budgets to stem the sovereign budget deficits are not done. The re-regulation of banks is a work in progress. Currency union is not working well. Policy failures should be expected. The issue is whether we accept these actions as experiments that may fail and require new options. The shadow banking system, non-bank lending institutions, was viewed as a problem in the 2008 crisis, yet now it may serve as the savior of the financial markets. Shadow banking is now back to pre-2008 levels and as banks exit markets, it is the shadow system of private equity, hedge funds, and money market funds, which is offering lending facilities. Regulators and policy-makers want banks to shrink but lending is till the life blood of any economy, so there will be new institutions to take the place of banks. Banks have a high cost structure and are not able to make their spreads given the flattening of the yield curve. 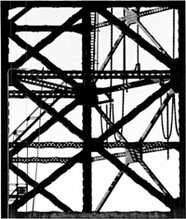 Shadow financial intermediaries are not subject to Dodd Frank and Basel III. In the short-run, this will serve as a safety value for those who need funds, but in the longer-run, regulators may lose the control that they desire. Supply and demand does work! When prices go higher, there will be demand rationing as clearly note in the USDA higher than expected stocks number last week. When corn prices were above $7.5 per bushel last June buyers back-off. This process actually started the previous year since prices were at record levels in 2010. Demand cuts do not respond immediately, but companies start to look for substitutes and start to squeeze out every last ounce of production. Innovation takes hold and works. The food inflation of last year around the globe is down. Global consumption is still had high levels and this is not going to change. Price levels will be remain high but a one direction market is off the table until we see developments in the Midwest weather pattern for planting. Corn around $6 per bushel is more likely than any extremes from last year. Chinese economists may view their work as policy-makers as an engineering problem. This is not dissimilar to the optimal control school of economists in the pre-rational expectations era. Of course, they have a greater degree of control than current Keynesians. What this means is that if we get a slowdown in inflation, there is more room for stimulus from the Bank of China. Inflation is moving lower in China given the decline in food prices. Food is a more important component in their inflation index. The supply shock of 2011 is starting to be reversed. This leaves room for more aggressive growth policies, or at least this is the hope from the rest of the world. Every central banker is now looking to a,lowering of inflation which will give them the green light for stimulus. Oil refiners are still a local business. If there is a slowdown in the OECD growth rates, there will be increases in idle capacity. All of the new capacity growth will be in the emerging markets to meet their demand. The rationalization of refining market will lead to future volatility if there is an increase in growth. Unlike crude, it is harder to move refined products around the globe especially if margins are weak. The movement of product means that there can be increasing volatility as shortages or bottle-necks will create price spikes. China demand was still strong in December with trade data showing copper imports hitting record levels and increases in demand for both oil and iron ore. Copper demand was up 47 percent to over 500,000 tonnes. China is the world largest consumer of copper, coal, and cotton to name just a few commodities. Of course, the Chinese seem to have gotten fairly smart about when to enter the market. They are looking for weakness to be buyers. The Chinese are also looking to further develop pricing power through commodity futures markets. China can produce a floor on commodity prices. They will not be able to stop a price decline, but if the Chinese provide stimulus to their economy, there will be a direct impact on commodities which will be much larger than anything that will happen from the Fed. To be a commodity analyst, you have to be a China macro specialist. 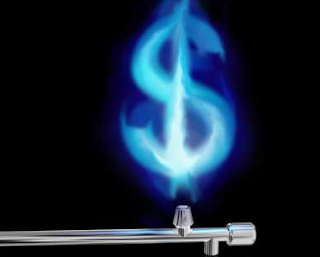 Natural gas has fallen 32 percent in the last year and now trades below $3 mBTU. Cold weather this week-end will not help the market. The hort-term demand of turning up the thermostat will not solve the problem. Pricing moving to the marginal cost will not help the market either. Even with price at marginal cost, there are other liquids coming out of the gas wells as the by-product sales make pumping still profitable. Rig counts are down but each rig is able to get more through advanced drilling techniques. Production in the US is at all time highs and foreign companies want into the US market. There is just no place to put the gas. Demand will increase but not quickly enough. LNG is a possible but there will be a fight as industrial companies who like cheap gas do not want to see this production input move into the global market. The only way this problem can be solved if there are companies which go out of business and there is market rationalization. This has the marks of a bubble. Article in the FT 1/12/12, "Greeks and Spaniards line up to learn the language of Goethe" is telling of one key monetary union issue. To solve the problem of unemployment across countries within the Euro-zone, there has to be mobility between countries so that there can be equalization of employment. Labor has to move to low unemployment regions. The southern unemployed have to move to the key northern, German, regions. This labor movement is restricted when there is a set of countries within a monetary zone which do not have common language. There cannot be the free movement of labor like the free movement of capital when there is a language barrier. If those who are unemployed can learn languages, then there can be the potential for labor movement. This is not going to solve the Euro-zone problems but it clearly shows what is one of the key impediments to labor problems across countries. The unemployed know it and are trying to address it through private means. Underestimating fixed exchange rates - the 1960's. While Bretton Woods international financial system does not fail until the early '70's, the problems of fixed exchange rates and inflation start to develop great fractures in the global economic system during this decade. The dollar dilemma becomes evident. Underestimated inflation - the 1970's. The commodity supply shocks coupled with loose monetary policy lead to the Great Inflation and stagnation of the '70's. The destruction of fixed income investments and poor equity returns lead to a defensive decade. Underestimated the Fed's fight of inflation - the 1980's. The tight monetary policy from Paul Volcker with the deregulation revolution were the highlights of the '80's Still breaking inflation and the long bond rally made all the difference for the decade even with the '87 crash which was not a long-lasting drama. Underestimated of market resilience and the Great Moderation - 1990's. The emerging markets saw large market failures in '94 and '98. The European and sterling managed floats were destroyed, but the real story was one of Moderation and success. However, the decade ended with the internet bubble. The key issue was the macroeconomic complacency that monetary and fiscal policy could solve all problems. Underestimated mortgage risks, bubbles, and the Great Recession - the 2000's. The first decade of the new century was one of deflation fears which led to the mortgage bubble. Deep business cycles were thought to be a thing of the past given the views developed surrounding the Great Moderation. 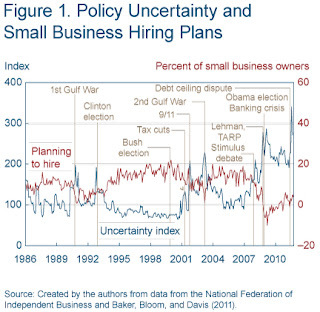 The end result of policy complacency was the failure of '08. Underestimated sovereign risk - the 2010's. The current decade will be the destruction of the risk-free asset concept. The idea of market safety assets will end and a new era of financial repression will take hold of the globe. Fed's interest rate forecasts - will this help? From its next meeting at the end of January, the Fed will replace its current guidance of exceptionally low interest rates “through mid-2013” with interest rate forecasts from each Fed policymaker for both the end of 2012 and the “next few calendar years” after that. The Fed has announced that it will produce interest rate forecasts starting with the next Fed meeting. This is close to announcing an inflation target since nominal rates are just combination of real rates and expected inflation. However, there is more to this than just an surrogate inflation target. There will be a real component that this consistent with its dual policy mandate. It is true that the Fed has not been a good interest rate forecaster and they have not been able to target longer-term rates with any consistency so there is a danger here. The market may perceive they have more power than it actually has at meeting its forecasts. It will be interesting to see what they will do to actually reach or meet their forecasts. In fact, there is a key distinction between forecasts and targets. It is clarity between forecasts and targets which will be the most important information necessary for the markets. what happens if there is forecast error? How will the Fed adjust? These are issues that need to be addressed soon. It is not clear this will help the markets. There are certain policy mixes that dominate in any given period. Most countries are following the same combination, loose monetary policy and tight fiscal policy. This is especially true of developed countries. The result of easy monetary policy is that real rates are being taken to negative levels in an effort to reduce or eliminate the fiscal drag from tight government spending policies. Additionally, the loose monetary policy offsets the large budget deficit problems as negative real rates reduce the cost of budget deficits. This places a negative bias to currencies relative to those countries which follow a different mix and a positive bias toward commodity prices. Bonds will do well as rates are pushed to further negative levels. Equities will be mixed because of the offsetting policies in fiscal and monetary policy. Of course, this a dangerous policy mix because there is potential for higher inflation when economies improve or fiscal policy becomes looser. The US is following a relatively loose monetary policy which is on the cusp of having another round of quantitative easing. The fiscal side is tightening even with large budget deficits because the stimulus of 2009 has run out. The Euro-zone clearly has a tight fiscal environment to stem the tide of debt downgrades and large budget deficits. The ECB is engaged in a non-announced QE program with strong lending facilities for banks. This will be further loosened if they announce a program of QE. The UK has continued to follow its tight fiscal/loose monetary combination. Japan has tightened ineffective fiscal policy with the monetary policy that should follow further easing. The emerging markets are starting to loosen and have not generally followed easing fiscal policy. The net result may be slower growth with ambiguous currency markets. Currencies will not able to provide the boost expected if all countries are following the same mix. The German short-term ates have turned negative sending an important signal on credit risks in the Euro-zone. Market rates have been negative since before Christmas but now the German government can auction bills and receive the full benefit. When rates turn negative it is not a positive signal of economic or financial health. It is saying that investors in the Euro-zone do not want to hold cash instruments in other countries at any cost. They do not wnat to hold it any bank in Europe. They are willing to pay the German government to hold their wealth. It also states that there are limited opportunities in Germany. This is flight to safety taken to the next degree. 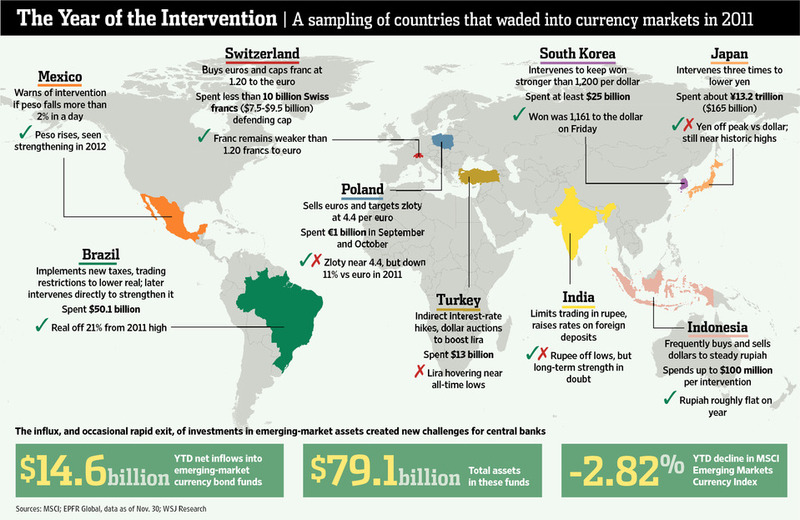 Currency markets faced a higher level of intervention than what we have seen in years. Governments are more nervous about their export business and the quality of the global economic recovery. 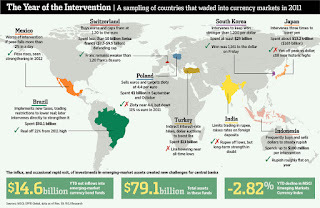 It was surprising how little intervention occurred in 2009 and 2010 even with the comments that we will be entering currency wars, but we are now facing a higher degree of government intervention. It is taking more complex forms instead of outright purchases or sales of currencies. Governments are more willing to use tax policies and capital controls to control exchange prices. The devil will be in policy details. Irving Fisher was dismissed during the Great Recession because he made the statement that stocks were at a permanent plateau right before the stock market crash, yet he was one of the most insightful economists on debt cycles. In summary, we find that: (1) economic changes include steady trends and unsteady occasional disturbances which act as starters for cyclical oscillations of innumerable kinds; (2) among the many occasional disturbances, are new opportunities to invest, especially because of new inventions; (3) these, with other causes, sometimes conspire to lead to a great volume of over-indebtedness; (4) this in turn, leads to attempts to liquidate; (5) these, in turn, lead (unless counteracted by reflation) to falling prices or a swelling dollar; (6) the dollar may swell faster than the number of dollars owed shrinks; (7) in that case, liquidation does not really liquidate but actually aggravates the debts, and the depression grows worse instead of better, as indicated by all nine factors; (8) the ways out are either laissez faire (bankruptcy) or scientific medication (reflation), and reflation might just as well have been applied in the first place."